I'm sitting here (possibly in my underwear), listening to U2's "Angel of Harlem" on the old record player (by "record player," I mean "iPhone," unfortunately) possibly one of their most underrated songs. And I have to say, sometimes not having to go to work isn't all that bad. And then reality sets in, and the amount of open jobs for which I'm qualified that appear on the various jobs posting sites dwindles every day. And the jobs that I do apply for--sometimes five or six a day, sometimes one or two a day, and all of which I am eminently qualified for--seem not to care very much about me at all. And now the iPhone has jumped to the next track on my playlist, which is, fittingly, "Misery," by Soul Asylum. And now the music has stopped, which means I really need to A.) Put on some pants, and 2.) Get to writing this week's Waiting for. 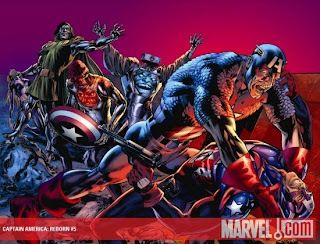 There's a lot of product coming from Marvel and DC today, including Captain America: Reborn, issue 5, Dark Avengers, issue 12, Justice League of America, issue 40 ( a Blackest Night tie-in), and several Batman family titles. But I want to focus today on the "smaller" publishers (it's in quotes because they aren't exactly printing xeroxes out of their garages, ya know), because there is some really great product shipping from Dark Horse, Dynamite, BOOM!, IDW, and Albatross Exploding Funny Books. Yes, that's the name. 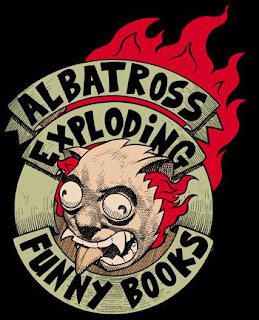 And yes, if you have no idea what an Albatross Exploding Funny Books is, don't worry. I'll get to it in a bit. First off, the entire first wave of Dark Horse character-themed GelaSkins (previously mentioned in our Gifts for Geeks: Santa's Little Helper post last week) ships to comics shops today. 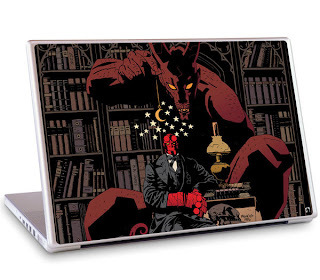 These are protective covers for iPods, iPhones, and laptops, and they feature some great artwork by Dark Horse's top talent. I'm willing to bet there are some shops that will have ordered at least a few of these, so ask your retailer. Additionally, there are more characters and titles available on the Dark Horse Web site. Also from the Horse this week, the softcover edition of Eric Powell's Goon epic, Chinatown and the Mystery of Mr. Wicker, finally sees print. Previously available only in a more expensive hardcover collection, this softcover trade is a must-read story for Goon fans. So, if you've been waiting for the price to be right in order to pick this story up, then wait no longer. Go forth, dear reader, and buy. From Dark Horse, we now shift gears to Dynamite, and their latest novel adaptation by Leah Moore and John Reppion. I've praised this writing team before for their comics adaptation of Bram Stoker's Dracula, which I felt was/is the best graphic adaptation of the source material, ever. Following up on the success of The Complete Dracula, and Sherlock Holmes, Dynamite presents The Complete Alice In Wonderland. 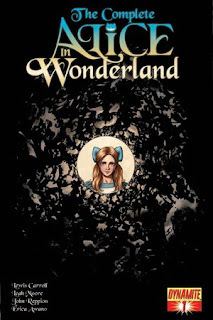 For the first time ever Lewis Carroll's classics, Alice's Adventures in Wonderland and Through the Looking-Glass with "The Wasp in a Wig," the "lost chapter" (from the Looking-Glass) are adapted into one complete tale. In this All Ages adaptation, writers John Reppion and Leah Moore are joined by Erica Awano for a 4 issue adventure down the rabbit hole! Now, the only caveat here is the price--each issue is $4.99. And, even though the books are packed with story and extras, this may be a great series to wait for the trade on. Their Complete Dracula was very much the same way, and I personally picked up each issue because the original is so near and dear to my (dark, black) heart. But these are certainly stories meant to be read as a whole, and the deluxe hardcover editions Dynamite has put out do the books great justice. Next up, we have the latest offering from BOOM! Studios, Mark Waid's Incorruptible, issue 1. Spawning out of Waid's hit series, Irredeemable, this book looks to go in a different direction. I'm recommending this title for a couple of reasons. First, it's Mark Waid, so you know you will be getting a quality story. Second, Irredeemable is easily one of the top five best super hero books being published today. And third, if you're still not convinced, go check out a free five page preview over at Boom! Last April BOOM! Studios showed the world that MARK WAID IS EVIL with the smash-hit series IRREDEEMABLE. This December, BOOM! shows the world that Mark Waid is now... INCORRUPTIBLE! Super villain Max Damage had an epiphany the day The Plutonian destroyed Sky City. When The Plutonian turned his back on humanity, Max Damage decided to step up. Now Max Damage has changed his name to Max Daring and turned from his formerly selfish ways to become...INCORRUPTIBLE. 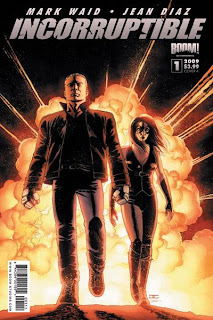 And, like I said, anything to do with Irredeemable will be a must-read for me. Though the concept of that series isn't anything new--Superman gone bad--the delivery of the story and the effect of the main character on the world at large, and his closest friends, is something special in our little hobby of capes and tights. If you haven't done so already, I'd suggest checking out Irredemable, volume 1, which you should be able to find at your comics shop, for only $9.99, before diving into this latest series. And if you're still looking for a great gift idea, think about giving someone Irredemable. It's a good "gateway" book, meaning I think it could help ignite an interest in the medium by a "civilian." 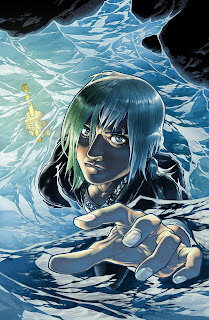 Moving right along, we have issue two of the new Locke & Key series from IDW, entitled "Crown of Shadows." This book, written by Joe Hill and with art by the great Gabriel Rodriguez, is another title that you may want to consider going back and finding the trades for. This latest story is the third volume of the title, and the previous two are collected (both in beautiful hardcovers, and in trade paperback form). I've praised this series since its inception, and I'll continue to do so. This is one of--if not the--premier horror books in all of comicdom. And the first two collections are another great gift idea for the horror hound in your life. As for this new series, "Crown of Shadows," you really need to be caught up with the story as a whole in order to understand what's going on. If you haven't yet read any of the books, check 'em out in trade and see if they're your kind of thing. And, if you've been reading since the start, well, I don't have to tell you to go and pick this up today. Give it a shot if you haven't already--I think you'll enjoy it. And, finally, we have the latest offering from the thought-to-be-dead, but still legendary Albatross Exploding Funny Books. 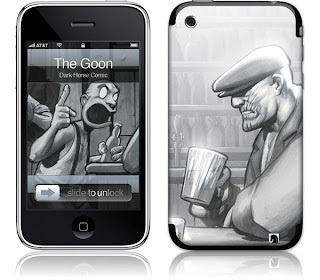 Years ago, Eric Powell left Avatar to self publish this little book called The Goon. So, he started Albatross Exploding Funny Books, which put out five issues of Goon goodness before Powell's creation was picked up by Dark Horse. Now, Powell returns to Albatross with a book that's been getting some pretty great reviews. From all accounts, you can expect for this book to be severly under-ordered (just like The Goon was, way back when), so they might be tough to find (or non-existent) at your local shop. Eric Powell, creator of the award winning series The Goon, brings his offbeat humor and distinctive style to his newest creation! 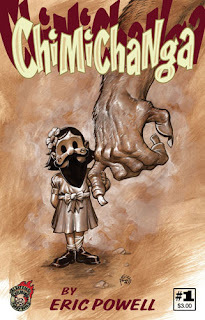 A story fit for youngsters, Chimichanga tells the tale of a bearded girl, her less than spectacular traveling circus, and a bizarre creature that turns their lives upside down. 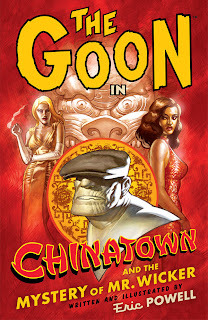 Discover Powell's first written and illustrated creator-owned series since The Goon. As I've said many times (right here, on this very blog! ), I will read anything Powell does, so I am very excited about this new book. I have no idea what to expect from it--and that's exactly what an Eric Powell book should be. Welp, that's all from me today. Sorry for the laundry list style of this post, but I guess with the holidays being here, making lists is becoming second nature. Anyway, what are you Waiting for?